I understand the benefits of reusability for the rocket booster. But I don't understand why they're landing it on a barge. I've read tons of articles about this but not one has even hinted at an answer. Why is landing on a barge preferable over a launchpad or any other large flat surface that isn't moving with the waves? Edit Jan. 25, 2015: Geoffcc recently provided a link to words straight from the Horse's mouth, Elon Musk. Musk says the payload hit for RTLS (Return To Launch Site) is 30% vs a 15% payload hit for landing on a downrange ocean platform. Musk also said said safety is a reason for having an ocean landing platform -- "As far as the safety aspect of the return to launch site of the first stage that's part of why we want to do it first in the ocean just to make sure that things will be fine. For any landing area that we would have, the landing ellipse, the sort of error that the stage could encounter would be an unpopulated region. So we would aim to have a landing site that's unpopulated with a radius of a couple of miles (which can be achieved in Cape Canaveral and Vandenberg)." To get back to the launch pad, a booster stage would need to kill it's eastward velocity and then do a westward burn. This extra delta V "boost back" expense inflicts a penalty on payload mass as others have said. I had imagined a near parabolic trajectory for the booster's path from launch site to barge but Ross' graphic indicates a boost back burn as well as a reentry burn and landing burn. I haven't been able to get actual numbers but the delta V savings of this path doesn't seem that great. Further, if this sort of barge landing offers substantial delta V savings over RTLS, then why is SpaceX still negotiating with the air force for the use of SLC 13 for RTLS? Most people would cite danger to populations and property as the foremost reason to stay away from land. You're setting down a rocket on a tail of flame like a 50s sci-fi film, after all. But the economics of the launch physics is the overwhelming factor. The "flying over populated areas" question is pretty much solved by their options to launch, currently coastal areas. By the time of the first stage MECO (Main Engine Cut Off) and separation, the Falcon 1st stage is significantly northeast of Canaveral, with nothing but water underneath. Elon Musk did pitch trying to fly back to the launch pad, but the tyranny of the rocket equation makes the price exacted on payload unacceptable. Even if some of the booster cores from the Falcon Heavy make it back to shore (and this remains to be seen), they still plan to land the center core on a barge. I see nobody seems to have mentioned the simplest reason why they're not landing on land: there isn't any. They launch east from Florida, and there aren't any islands in the Atlantic out there. Without a major course change from the first stage, which as other people point out would use a prohibitive amount of fuel, then it's basically going to come down in vast stretches of empty ocean. Hence the barge. The only reason SpaceX is landing on the barge is to demonstrate to the range safety community (and themselves) that they can safely and reliably land the first stage. There is a very little propulsive advantage to landing on the barge where SpaceX is positioning it vs. returning to the launch site. A good video showing SpaceX's aspirations in this area is shown in this video. As this question has resurfaced following the Jan-2016 launch of Jason-3 it is worth flagging this news article that says, precisely, why a barge landing was selected in this case. The source of the quote, Hans Koenigsmann, is vice president of mission assurance at SpaceX. Now that we've seen 4 landing attempts, it's time to revisit this question. We've seen both options (landing on a barge and on land) being used, albeit not yet successfully for the barge landing. They prefer to land the stage on land, if that's possible. This can only happen if there is sufficient margin to account for the extra fuel needed by the boostback burn. 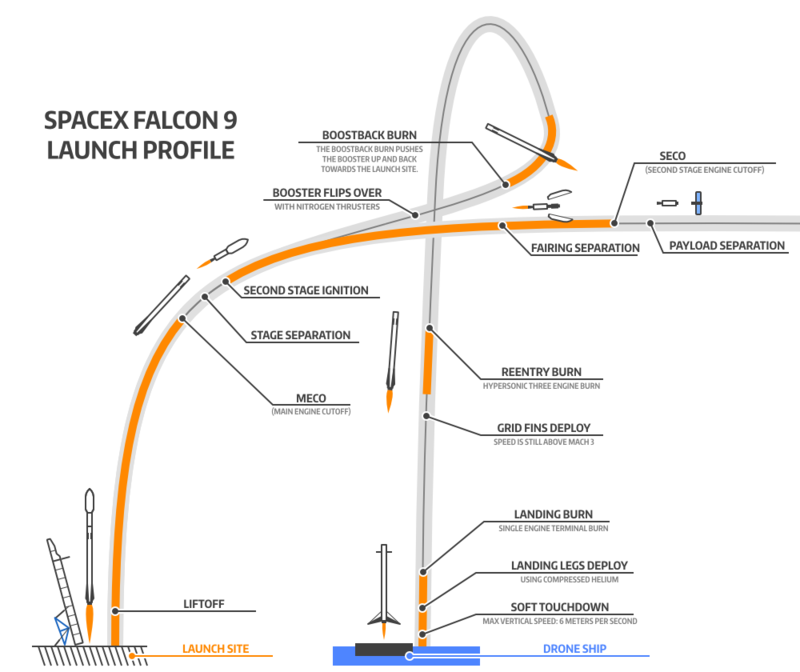 The Falcon 9 has some flexibility: the first stage cutoff point can be at speeds between 6000-9000 km/h (1670-2500 m/s). The speed chosen depends on the mission: missions to a high-energy orbit (GEO, heavy payloads) need a higher staging speed. At the high end of that speed range, there's not enough fuel left for a return to the launch site, so the second option is to land the stage on the barge. Ship landings are needed for high velocity missions. Ship landings are not needed for flexibility or to save fuel costs. If speed at stage separation (higher than) ~6000 km/hr. With a ship, no need to zero out lateral velocity, so can stage at up to ~9000 km/h. They also used the first two barge landings to test the landing process and build confidence they can land the stage accurately. This may have been a requirement imposed by Cape Canaveral, but I haven't seen evidence either way. The first landing on land (Falcon 9 Flight 20, Orbcomm-2) showed SpaceX can provide a safety margin for landings on land: after the reentry burn, the stage is on a trajectory towards a point just off the coast. If the landing burn fails (engine doesn't start), the stage will splash down harmlessly. Why is spacex trying to land on a barge? Numbers for Falcon 9 booster MECO scenarios? Why does the SpaceX reusable launcher use vertical rather than horizontal landing? How was SpaceX able to keep the rocket from tipping over on the barge?